Hello again! It's time for another installment of Pin Busting! I really do love doing these, and it's been far too long. I was cruising around Pinterest, basically killing time until dinner, and I stumbled on to a great board full of proposed makeup dupes. Quite a few caught my eye, and have been pin'd for future investigation...but this one really grabbed me. Not a month ago, I picked up Landinski from H&M. I knew that I had to test this one for myself. The pin that started it all led back to this post. It appears to be an...instagram (?) account for makeup dupes, which of course I love. A quick perusal tells me that, for the most part, the dupes are sound. But I knew that this one, at least to me, was not a dupe at all. In the pictures, these two look amazingly close. I'd call them mostly dupes...especially if you are on a budget. The MAC version retails for around $16, whereas the H&M one can be grabbed for about $6. The similarities in the pictures above are most obvious when actually worn. 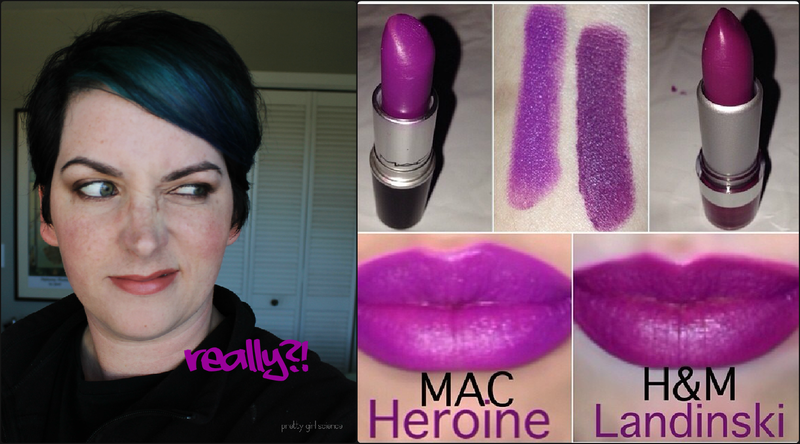 Heroine is a very muppety kind of matte purple. It isn't drying, but it definitely feels like a proper matte lipstick when on the lips. It stays where you put it, and I generally don't feel like I need a lip liner with this. Landinski, in contrast, feels like a cream. It slips right on like a balm, and definitely doesn't feel dry at all. In the short time that I wore it, it did feather a bit...but not as bad as I was expecting. 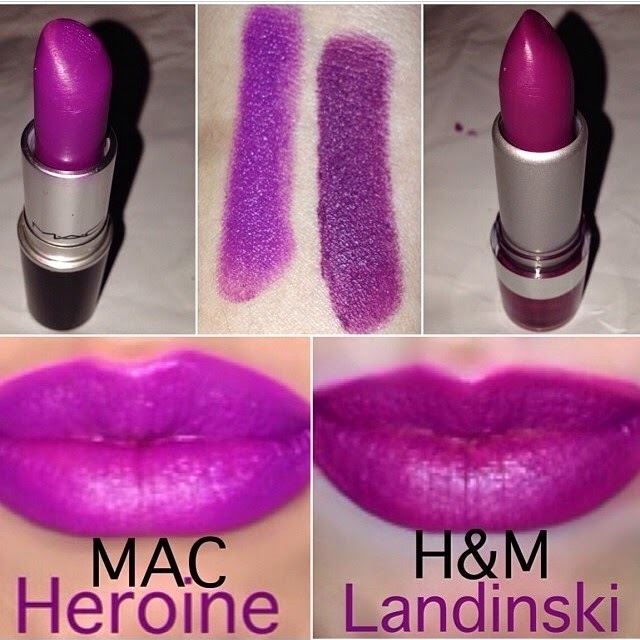 Heroine smells like a typical MAC lipstick: that weird vanilla cupcake scent that reminds me of birthdays. Some folks don't like it, but I do. Landinski smells like...cough syrup. Ok, not really. But it has that artificial grape scent that I immediately associate with childhood illness. It lingers too...my husband refuses to get near me while wearing this stuff because of the smell. Heroine is a very long wearing lip product. I've applied it at 5pm, and still had plummy pink lips at 9am the next day. Even a thorough rubbing with oil doesn't completely remove the tint. I actually like this, because if there is any wearing throughout the day, the strong staining will hide it. I've worn this through two meals, drinks, and plenty of talking with minimal fading. Landinski, because it is so creamy, doesn't have as long a life on the lips. It managed to survive through a glass of water, but could not stand up to a carefully-consumed sandwich. It is pretty obvious that these aren't dupes. I don't even think they are that close. I even forced the husband to weigh in on this, since he is usually pretty bad about colors. "Is this a trap? Are they supposed to be the same? That top one is...I dunno, more brown? It looks like you mixed that bottom one and brown together. Is that the right answer?" Bless him. He's getting better about this stuff, but colors just aren't his thing. He actually nailed this one though, because I think the same thing. 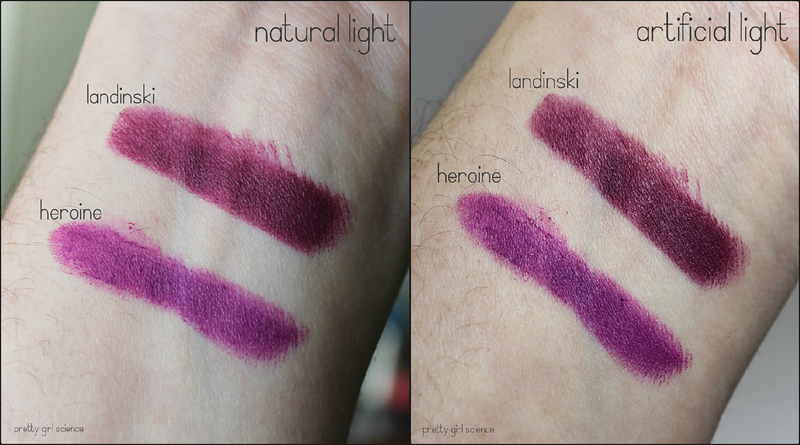 Heroine is much less red than Landinski in both natural and artificial lighting. Maybe at night, the difference wouldn't be as obvious? TL;DR is if you are looking for a plummy wine, Landinski is for you. If you want purple...stick with Heroine. Ohh I love this idea! Especially since most of the stuff you find on Pinterest is usually more than a bit questionable. The two colours don't look anything alike in my opinion, they're in the same colour group but the undertones are completely different! Oh, its a fun idea. Pinterest is so full of...baloney sometimes. And I completely agree. These two colors aren't anything alike. Especially not in person. I think the picture from the original pin was horribly photoshopped.